In a new book, the former Federal Reserve chairman reveals who were the smartest presidents he worked with and where some administrations have gone wrong. (Fortune Magazine) -- If you want to know the mind of Alan Greenspan, you might start with this: Before he entered public life in the 1970s, all his top deputies at his flourishing economic consulting firm were women. "It just made great business sense," he writes with the unexpectedly sunny wonkiness that pervades much of his memoir, "The Age of Turbulence." "I valued men and women equally, and found that because other employers did not, good women economists were less expensive than men." Now, a feminist, a socialist, or a churl might take issue with this sort of thinking. But Greenspan says there was an ancillary benefit to his self-�interest: His hiring practices, he points out, "marginally raised the market value" of female economists. This do-good-by-doing-well sentiment comes straight out of the playbook of his hero, Ayn Rand. But Rand was only a thinker; Greenspan, it could be claimed, was for two decades the most influential economic actor the world had seen since V.I. Lenin emerged from his railroad car in St. Petersburg. "The Age of Turbulence" is for half of its substantial length remarkably engaging - no small feat for a memoirist who at times seems to view the world as a convenient laboratory for measuring the effects of interest rates. 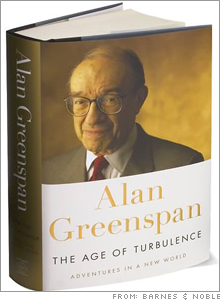 This captivating half is devoted to Greenspan's career, especially the two decades he spent as Fed chairman, pulling, plucking, and sometimes rudely yanking the strings that tie the world's economies together (however much he admires the "invisible hand" identified by Adam Smith, Greenspan has a warm fondness for the Fed's brass knuckles too). The book's second half, which he describes as "the foundation on which to erect the conceptual framework for understanding the new economy," is as compelling as it sounds. You will not be surprised to learn that Greenspan is not much of a gossip (not for nothing did Rand call her young, woefully solemn acolyte "the Undertaker"). Nor is he particularly eager to use his book as a bludgeon, or even a rapier, to maim the officeholders he periodically battled. At times his comments on specific politicians are as opaque as some of his famously obtuse appearances before congressional committees, when he displayed his fluency in the impenetrable diction of Green-speak. But when Greenspan asserts that Richard Nixon and Bill Clinton were "by far" the smartest Presidents he worked with, those two little words say quite a lot about Gerald Ford, Ronald Reagan, and a couple of guys named Bush. With the first George Bush, Greenspan had what he calls a "terrible relationship." He faults the administration of Bush II for a �decision-making process driven entirely by political calculation. By comparison, he found the Democratic interregnum sandwiched between two slices of Bush a version of Periclean Athens, where dedicated men (Bob Rubin, Larry Summers, Clinton, himself) made decisions in the nation's long-term interest. Give the man credit: He helped persuade a Democratic President to base his economic policy on a balanced budget. "If the story of the past quarter of a century has a one-line plot summary," Greenspan writes, "it is the rediscovery of the power of market capitalism." This may be true, but it is modesty of a sort: He could just as easily have said, "it is the elevation of a wonky advocate for market capitalism to the status of cultural icon." How wonky? Well, on one trip abroad, Greenspan was moved to ask his companion, "What is the value-added produced in this city?" Reasonable enough - except the city was Venice, the companion was his bride, and the trip was their honeymoon.